Functional vision is essential for efficient learning and comprehension. This Goal-Oriented Curriculum is a comprehensive approach to visual efficiency. These materials clearly identify four progressive categories of functional vision. The 4 categories include: Learning to Orient the Visual System, Helping the Visual System Move and See, Beginning to Process Visual Information and Making the Visual System Efficient for Learning. 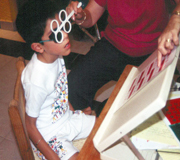 An easy-to-use approach for initiating a functional vision therapy program. Functional vision training in combination with a developmental hand program and neuropostural organization can be effective in overcoming learning problems. Please enter the quantity you would like to order and click the Add To Cart button.